Barlaam of Seminara (Bernardo Massari, as a layman), c. 1290–1348, or Barlaam of Calabria (Greek: Βαρλαὰμ Καλαβρός) was a southern Italian scholar (Aristotelian scholastic) and clergyman of the 14th century, as well as a Humanist, a philologist, and a theologian. When Gregory Palamas defended Hesychasm (the Eastern Orthodox Church's mystical teaching on prayer), Barlaam accused him of heresy. Three Orthodox synods ruled against him and in Palamas's favor (two "Councils of Sophia" in June and August 1341, and a "Council of Blachernae" in 1351). Barlaam was born in what is now the commune of Seminara, Calabria. Despite the general belief that Barlaam converted to Orthodox Christianity, Martin Jugie argues that he was in fact baptized and brought up in the Orthodox tradition. Bernardo moved to Constantinople in the 1320s, where he soon gained entrance into ecclesiastical and political circles, especially those around the emperor Andronicus III Palaeologus, who gave him a teaching position at the university. He was made Basilian monk at the monastery of Sant'Elia di Capassino and assumed the name Barlaam. Eventually, he was made the Hegumen (abbot) of the Monastery of Our Savior, and two confidential missions on behalf of the emperor were entrusted to him. Colin Wells characterizes Barlaam as "brilliant but sharp-tongued", describing him as "thoroughly versed in the classics, an astronomer, a mathematician, as well as a philosopher and a mathematician. However, according to Wells, "this formidable learning was coupled with an arrogant, sarcastic manner, so caustic at times that he put off even friends and allies." During the years 1333–1334, Barlaam undertook to negotiate the union of churches with the representatives of Pope John XXII. For this occasion he wrote twenty-one treatises against the Latins in which he opposed papal primacy and the filioque doctrine. Emperor Andronicus III sent Barlaam on important diplomatic missions to Robert the Wise in Naples and to Philip VI in Paris. In 1339, he was sent to the exiled Pope Benedict XII at Avignon to suggest a crusade against the Turks and to discuss the union of churches, but he was not successful in this endeavour. On this occasion he met Petrarch. Returning to Constantinople, Barlaam worked on commentaries on Pseudo-Dionysius the Areopagite under the patronage of John VI Kantakouzenos. Around 1336, Gregory Palamas received copies of treatises written by Barlaam against the Latins, condemning their insertion of the Filioque into the Nicene Creed. Although this stance was solid Eastern Orthodox theology, Palamas took issue with Barlaam's argument in support of it, since Barlaam declared efforts at demonstrating the nature of God (specifically, the nature of the Holy Spirit) should be abandoned, because God is ultimately unknowable and undemonstrable to humans. Thus, Barlaam asserted that it was impossible to determine from whom the Holy Spirit proceeds. According to Sara J. Denning-Bolle, Palamas viewed Barlaam's argument as "dangerously agnostic". In his response titled "Apodictic Treatises", Palamas insisted that it was indeed demonstrable that the Holy Spirit proceeded from the Father but not from the Son. A series of letters ensued between the two but they were unable to resolve their differences amicably. In contrast to Palamas' teaching that the "glory of God" revealed in various episodes of Jewish and Christian Scripture (e.g., the burning bush seen by Moses, the Light on Mount Tabor at the Transfiguration) was in fact the uncreated Energies of God (i.e., the grace of God), Barlaam held that they were created effects, because no part of God whatsoever could be directly perceived by humans. The Orthodox interpreted his position as denying the renewing power of the Holy Spirit, which, in the words of various Orthodox hymns, "made apostles out of fishermen" (i.e., makes saints even out of uneducated people). In his anti-hesychastic works Barlaam held that knowledge of worldly wisdom was necessary for the perfection of the monks and denied the possibility of the vision of the divine life. Steven Runciman reports that, infuriated by Palamas' attacks against him, Barlaam vowed to humiliate Palamas by attacking the Hesychast teaching for which Palamas had become the chief proponent. Barlaam visited Thessalonica, where he made the acquaintance of monks who followed the Hesychast teachings. Runciman describes these monks as ignorant and lacking a real understanding of the Hesychast teaching. Barlaam issued a number of treatises mocking the absurdity of the practices which he reported included, "miraculous separations and reunions of the spirit and the soul, of the traffic which demons have with the soul, of the difference between red lights and white lights, of the entry and departure of the intelligence through the nostrils with the breath, of the shields that gather together round the navel, and finally of the union of Our Lord with the soul, which takes place in the full and sensible certitude of the heart within the navel." Barlaam said that the monks had claimed to see the divine essence with bodily eyes, which he viewed as sheer Messalianism. When asked about the light which they saw, the monks told him that it was neither of the superessential Essence nor an angelic essence nor the Spirit itself, but that the spirit contemplated it as another hypostasis. Barlaam commented snidely, "I must confess that I do not know what this light is. I only know that it does not exist." According to Runciman, Barlaam's attack struck home. He had shown that, in the hands of monks who were inadequately instructed and ignorant of the true Hesychast teaching, the psycho-physical precepts of Hesychasm could produce "dangerous and ridiculous results". To many of the Byzantine intellectuals, Hesychasm appeared "shockingly anti-intellectual" Barlaam nicknamed the Hesychasts "Omphaloscopoi" (the navel-gazers); the nickname has coloured the tone of most subsequent Western writing about the Byzantine mystics. However, Barlaam's triumph was short-lived. Ultimately, the Byzantines had a deep respect for mysticism even if they didn't understand it. And, in Palamas, Barlaam found an opponent who was more than his equal in knowledge, intellect and expository skills. Gregory's teaching was affirmed by the superiors and principal monks of Mt. Athos, who met in synod during 1340–1. In early 1341, the monastic communities of Mount Athos wrote the Hagioritic Tome under the supervision and inspiration of Palamas. Although the Tome does not mention Barlaam by name, the work clearly takes aim at Barlaam's views. The Tome provides a systematic presentation of Palamas' teaching and became the fundamental textbook for Byzantine mysticism. In the third Triad, Palamas refuted Barlaam's charge of Messalianism by demonstrating that the Hesychasts did not share the antisacramentalism of the Messalians nor did they claim to physically see the essence of God with their eyes. According to John Meyendorff, "Gregory Palamas orients his entire polemic against Barlaam the Calabrian on the issue of the Hellenic wisdom which he considers to be the main source of Barlaam’s errors." It became clear that the dispute between Barlaam and Palamas was irreconcilable and would require the judgment of an episcopal council. A series of six patriarchal councils was held in Constantinople on 10 June 1341, August 1341, 4 November 1344, 1 February 1347, 8 February 1347, and 28 May 1351 to consider the issues. The dispute over Hesychasm came before a synod held at Constantinople in May 1341 and presided over by the emperor Andronicus III. The assembly, influenced by the veneration in which the writings of Pseudo-Dionysius were held in the Eastern Church, condemned Barlaam, who recanted. The ecumenical patriarch insisted that all of Barlaam's writings be destroyed and thus no complete copies of Barlaam's treatise "Against Messalianism" have survived. After leaving Constantinople, Barlaam was received into the Latin Church at Avignon in 1342 and was consecrated Bishop of Gerace. In 1346, he was appointed Papal Ambassador to Constantinople but, his mission having ended in failure, he returned to Gerace where he died in 1348, apparently a victim of the bubonic plague. 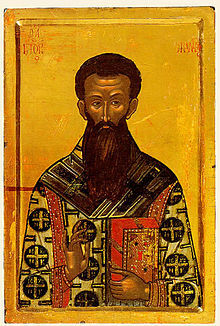 St. Gregory Palamas, with whom Barlaam engaged in his most famous theological controversy. Barlaam, by his upbringing and philosophy, spanned the gap between the Christian East and West. Though he was never able to synthesize both traditions in a satisfactory manner, he did end up influencing both. The Zealots of Thessalonica were influenced by Barlaam's teachings, and his arguments affected the dogmatic definition of Hesychasm in the Eastern Church. A master of the Greek language, he taught Petrarch some rudiments of Greek. Barlaam overestimated the significance of philosophy for theology, asserting that only through philosophy could humanity arrive at perfection. He thus denied the renewing power of the Holy Spirit, which makes saints even out of uneducated people, as it made the fishermen apostles. Being a humanist, Barlaam placed emphasis on created means of salvation (e.g., philosophy and knowledge) and reduced the role of the grace of the Holy Spirit. Barlaam's views - that we cannot really know Who the Holy Spirit is exactly (an outgrowth of which is agnosticism), that the ancient Greek philosophers are superior to the Prophets and the Apostles (since reason is above the vision of the Apostles), that the light of the Transfiguration is something which is created and can be undone, that the hesychastic way of life (i.e. the purification of the heart and the unceasing noetic prayer) is not essential - are views which express a supra-scholastic and, subsequently, a secularised point of view of theology. Saint Gregory Palamas foresaw the danger that these views held for Orthodoxy and through the power and energy of the Most Holy Spirit and the experience which he himself had acquired as a successor to the Holy Fathers, he confronted this great danger and preserved unadulterated the Orthodox Faith and Tradition. ^ Christopher Kleinhenz et al., Medieval Italy. An encyclopedia, I., Routledge, 1993, p. 97: "Barlaam the Calabrian (Bernardo Massari, c. 1290-1348 or c. 1350)." ^ Giovanni Fiore da Cropani, Della Calabria illustrata, III., Rubbettino, 1999. See also: Eugenio Garin, "History of Italian Philosophy", vibs, 2008. ^ Wells, Colin (2006). Sailing from Byzantium: how a lost Empire shaped the world. Random House, Inc. p. 47. ^ a b Saint Gregory Palamas (1999). Dialogue Between an Orthodox and a Barlaamite. Global Academic Publishing. p. 3. ^ (Runciman, 1986), p. 141. ^ a b c Runciman, Steven (1986). The Great Church in captivity: a study of the Patriarchate of Constantinople from the eve of the Turkish conquest to the Greek War of Independence. Cambridge University Press. p. 142. ^ (Denning-Bolle, 1999), p. 5. ^ Merriam-Webster's encyclopedia of world religions. Merriam-Webster, Inc. 1999. p. 836. ^ Parry, Ken and David Melling, ed.s, The Blackwell Dictionary of Eastern Christianity (Malden, Massachusetts: Blackwell Publishing, 1999), p. 231. ISBN 0-631-23203-6. ^ a b "Gregory Palamas: An Historical Overview". Archived from the original on 2011-09-27. Retrieved 2010-12-27. ^ (Denning-Bolle, 1999), p. 4. ^ a b Palamas, Saint Gregory; Meyendorff, John (1983). Gregory Palamas. Paulist Press. p. 4. ^ "accusing Gregory Palamas of Messalianism" (Antonio Carile, Η Θεσσαλονίκη ως κέντρο Ορθοδόξου θεολογίας - προοπτικές στη σημερινή Ευρώπη [Thessaloniki as a center of Orthodox theology - prospects in Europe today] (Thessaloniki 2000, pp. 131-140), English translation provided by the Apostoliki Diakonia of the Church of Greece). ^ Encyclopedia of Religion, 2nd edition (Macmillan Reference Books, 2005, ISBN 978-0-02-865733-2), s.v. "Barlaam of Calabria." ^ Metropolitan Hierotheos (Vlachos). Orthodox Spirituality: A Brief Introduction, (Birth of the Theotokos Monastery, Levadia, Greece. 1994, ISBN 978-960-7070-20-3), http://www.orthodoxinfo.com/inquirers/hierotheos_difference.aspx, accessed 2007-06-13. "Barlaam the Calabrian" from Science and Its Times. Thomson Gale, 2005-2006.